It was a beautiful Summer day for AQ and Cammie Shipley’s wedding! The day started with all of Cammie’s bridesmaids, Cammie’s mom and the bride herself having a wonderful brunch in the Baltimore Marriott’s bridal suite. Up Do’s for I Do’s arrived to do their hair and make up in the suite, while the groom went for a swim and relaxed in the jacuzzi. The bride and groom were so relaxed for their wedding day and it was nice to see them both relaxing and taking in the whole day! Fabrications came and set up the pipe and drape and starry night ceiling treatment for their reception. Little House of Flowers arrived to do the flowers for the ceremony and the reception and it was stunning! The ceremony started with The Antares Musicians playing the Wedding March and Cammie walked down the aisle with her Father, Cammie’s dress was stunning. 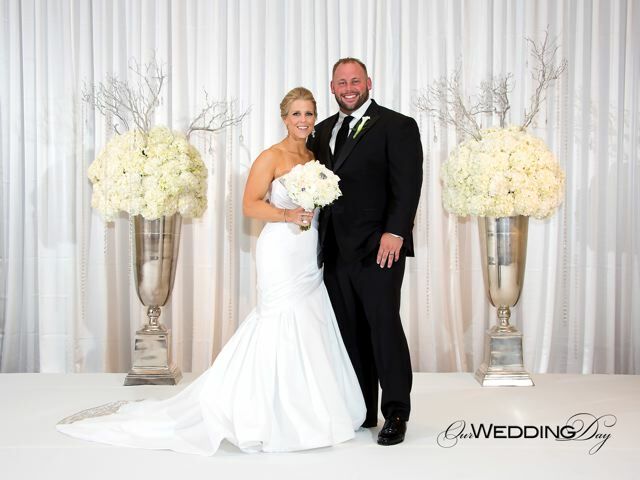 Cammie’s dress was a white strapless dress with the most beautiful stitched bling additions that just sparkled in the soft light of the ceremony. AQ was so handsome in his Black Suit and smiled from ear to ear as he saw his beautiful fiance come down the aisle. The reception theme was starry night and it was breathtaking when you entered the room, the entire room was pipe and draped in blue fabric, the ceiling had white tulle lit up with lights running all across the ceiling. The groom is from Pittsburgh and they have a cookie tradition so there were tables full of hand made cookies by family members for guests to enjoy and take home, across from the cookie table was a candy bar filled with blue, silver and white candies to go with their theme. Guests enjoyed 9 food stations of the bride and groom’s favorite dishes and guests danced the night away to AJ Productions DJ Matt Davis and when not dancing they were getting pictures in the Chesapeake Photo Booth. It was an amazing night and their entire night was captured by Formica Studios and The Documentist. We were holding on to these beautiful pictures and the wonderful video until What’s Up Weddings Fall Issue came out because they picked up the wedding in their fall issue. Please enjoy the video provided by the Documentist and see the additional pictures can be seen under the wedding gallery on our website. We wish AQ & Cammie Shipley many years of happiness!!!! We loved being a part of your special day!